Today I went to attend one session of the ongoing Naturalists’ Training Program that is being run by Jungle Lodges and Resorts…or rather, by its Chief Naturalist, S.Karthikeyan or Karthik, about whom I have written a lot on LJ! I met a great set of people, some of whom actually read my LJ…! 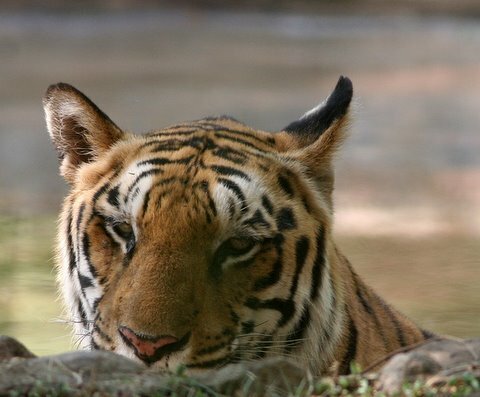 Naturalists cannot count the tigers, lions, and leopards at the Bannerghatta National Park as “wild” at all…these animals are so used to people going past in the safari vans they might almost be called semi-domesticated. But the fact is that they will never be entirely used to humans and will only tolerate them at best…. as was proved by a ghastly incident some years ago when a girl was pulled from a van (which had no grilles then) and killed and dragged away into the undergrowth. After I came home, and got rid of the day’s heat and dust with a glorious swim…. came over. Welcome, Vyshavi and hopefully, with you, and several others of your gang, too! Will post pictures and an account of the NT Program in a day or two..